Today is World Idli Day. But we at Indian Eagle are rejoicing in the victory of Biryani in Food Network’s Beat Bobby Flay, a popular American cooking competition and reality show hosted by celebrity chef and restaurateur Bobby Flay. The credit goes to Indian American chef Aarthi Sampath who won the “Beat Bobby Flay” competition on American TV for her Chicken Biryani dish. 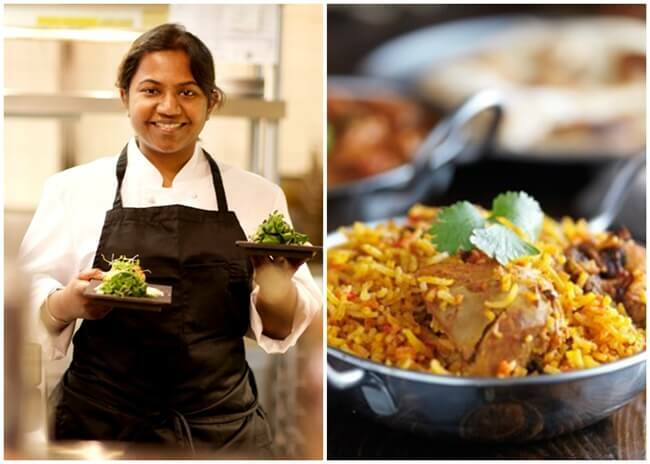 Chef De Cuisine at renowned chef Vikas Khanna’s Michelin starred Indian restaurant, Junoon in New York City, Chef Aarthi Sampath gave us a story of her winning Chicken Biryani recipe to add to our collection of interesting Biryani stories. Earlier, we featured Chef Aarthi Sampath in a news article about her success in Food Network’s culinary reality show ‘Chopped”, at Indian Eagle’s community portal, Travel Beats. In each half-an-hour episode of the Season 15 of Beat Bobby Flay, the host picks an ingredient to be used by two competing chefs in cooking a dish. Chef Aarthi Sampath and her competitor, Zoe Schor were given Fava Beans to use along with other ingredients in a dish in the last episode titled “Ladies Don’t Play.” She used Fava Beans in her unique recipe of Chicken Biryani and emerged as the winner of Beat Bobby Flay in Season 15. New York-based Chef Aarthi Sampath, whose journey from the kitchens of Mumbai to the culinary world of USA is full of gastronomic innovations, assisted Chef Vikas Khanna on The Billionaire’s Club Dinner that Indian Prime Minister Narendra Modi hosted at Waldorf Astoria in New York City. She mastered the art of Indian cooking at Taj hotels in Mumbai, Delhi, Hyderabad and Chennai for the initial five years of her career before she left for the United States at attend Johnson & Wales University. It is she who has been spearheading the growth and popularity of Junoon, Chef Vikas Khanna’s flagship restaurant which featured on our list of 10 Best Indian Restaurants in New York City, while going up the ranks from an intern to the head chef (Chef De Cuisine). Indian American Aarthi Sampath’s portfolio of culinary experiences also includes her association with chefs at the James Beard Foundation. Travel Beats is a leading Indian American community portal by Indian Eagle, a trusted air travel booking partner of Indians in USA. Subscribe to Travel Beats’ free newsletter for the latest immigration, visa, travel and community news. *Disclaimer: The image of chicken biryani in the picture is not the image of Chef Aarthi Sampath’s winning chicken biryani dish. Congratulation Miss Sampat. Another Indian success story in USA. Wow! Way to go Chef Aarthi. Wishing you the very best….flame on! Could I just get the recipe people!